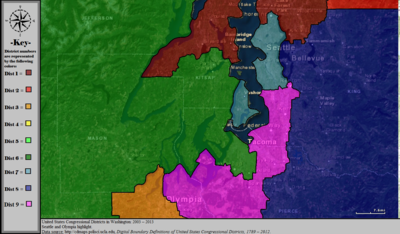 The following is a list of the ten congressional districts in the U.S. state of Washington. 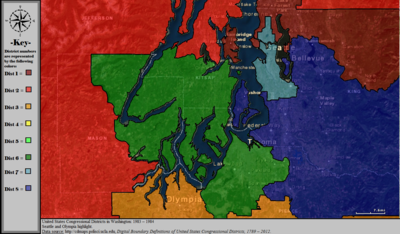 This article partially describes districts prior to the 2012 redistricting. From the time that Washington Territory was formed in 1853, through statehood in 1889, Washington Territory elected an at-large non-voting Delegate to the United States House of Representatives. At different times in its history, the state of Washington has also elected one or more representatives At-large statewide. List of members of the Washington United States House delegation, their terms, their district boundaries, and the districts' political ratings according to the CPVI. The delegation has a total of 10 members, including 7 Democrats and 3 Republicans. 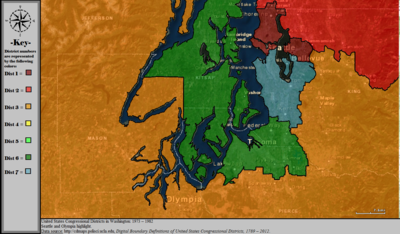 Table of United States congressional district boundary maps in the State of Washington, presented chronologically. 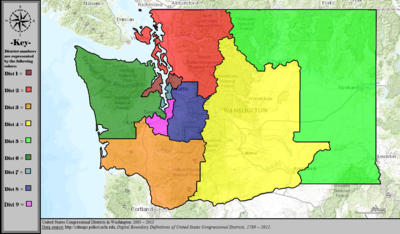 All redistricting events that took place in Washington between 1973 and 2013 are shown. 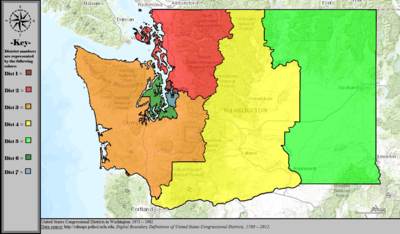 Washington is one of 22 states that do not give direct control of redistricting to the state's legislature. 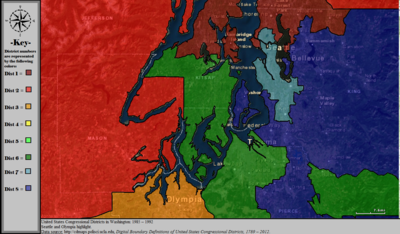 The state's congressional districts are determined by a four-member Washington State Redistricting Commission that is appointed every ten years. Two members are appointed by both of the state's legislative branches, with the Democrats and Republicans from each selecting one person. The four appointed members then vote to appoint a fifth, non-partisan chairperson that cannot vote. The commission is disbanded once they have approved a redistricting plan. In 1983, the voters approved a ballot measure to amend the state constitution to establish a redistricting commission. The first commission created under the changes completed their work as part of the 1991 redistricting. ^ Redistrincting. 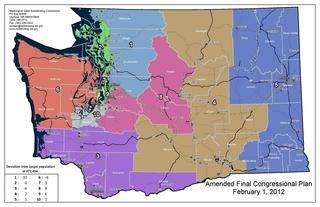 "Washington State Redistricting Commission". 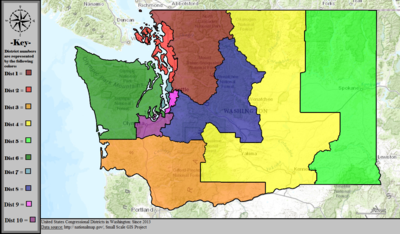 www.redistricting.wa.gov. Retrieved 4 April 2018.